The Mid Brain is also called Inter brain and is medically termed as MESENCEPHALON is a small region of the brain that serves as a relay centre for Visual, auditory and motor system information. The Mid Brain is located above the brain stem of human beings and is responsible for the perception of stimuli and the subsequent communication with the right and left hemispheres of the brain to process this perspective information. Typically as part of the lower brain Centres, the Mid brain is not subject to an individuals conscious awareness. Dr. Makoto Shichida who devoted more than 40 years of research into the functioning of the brain could discover the set of sound waves that can activate the Mid brain. It is crucial to awaken the mid brain in order to improve the capabilities of the human brain. The mid brain located at the centre of the cerebrum links and consolidates the functions of each part of the brain. It also allows the work of each file of the brain to appear into consciousness. The Mid Brain is in charge of controlling the entire human Organism including the viscera. The deep human consciousness controls the Mid brain. FUNCTIONS OF MID BRAIN ACTIVATION? It acts as a relay centre between the L/R brain and major communication between the 2 hemisphere happens through Mid Brain. It controls our 5 senses i.e. Visual, Auditory, Kinesthetic- Touch, taste & Smell. It controls attention, alertness, mood, etc. ACTIVATION STAGES OF MID BRAIN! Mid Brain is active till the age of 5 years and subsequently it gets inactive and remains inactive till the age of 15years and then starts getting calcified and becomes deactivated. WHEN SHOULD THE MID BRAIN BE ACTIVATED? Mid Brain should be activated for the children between the age group of 5 to 15 years. WHAT IS ACTIVATING A MID BRAIN? The Mid brain has to be awakened by stimulating a hormonal discharge in the human body. It is pituitary gland that regulates the hormone secretions and this function has to be awakened. For which the neighbouring Pineal gland has to be awakened. The Pineal gland secrets two hormones i.e. Melatonin & Serotonin. Serotonin is said to be very closely related to the evolution of species and has the capacity to increase the intelligence of the right brain. When individual grows older, the brain has the tendency to automatically assign one hemisphere and the process is called lateralisation. This means we end up using much less of our brain then we can actually use. HOW MID BRAIN IS ACTIVATED? There are many ways to activate the Mid Brain but the most effective and faster way to activate the Mid brain is by sending a special set of sound waves to stimulate the hormonal discharge. HOW DO WE KNOW THE MID BRAIN IS ACTIVATED? Once Mid Brain is activated child can sense the visual properties of an object. i.e. Colour and read Blindfold. BENEFITS OF MID BRAIN ACTIVATION! L/R BRAIN gets balanced that helps use more power of your Brain effectively and efficiently. 5 Senses becomes Super powerful. ANY SIDE EFFECTS AFTER MID BRAIN IS ACTIVATED? No, there is no side effects after midbrain activation. Once the midbrain is activated, the brain will secrete hormones to balance the development of left and right brain, in order for the brain to function at optimum condition. Children will become more intelligent, simultaneously will also coordinate the intrinsic characteristic to cause the human disposition to favor kindheartedly, and a sympathy. Midbrain is part of the brain tissue of the brain; we did not add any substances for students during the training process. Blindfolded self-training method (also known as midbrain activation) has greatly benefited many children before. 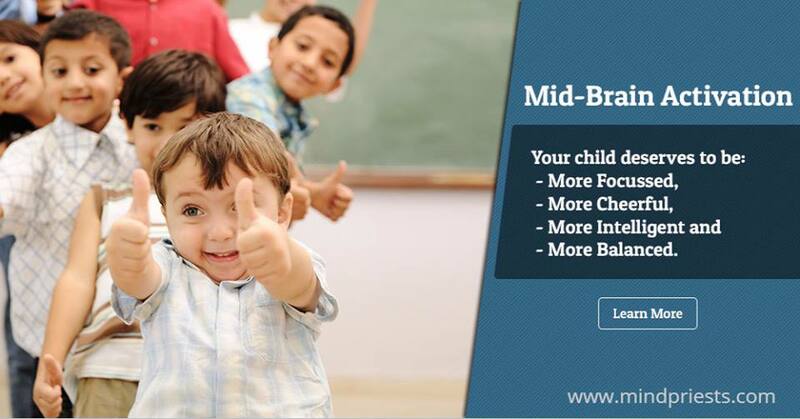 Therefore, parents need not to worry because midbrain activation has totally no side-effect for children.